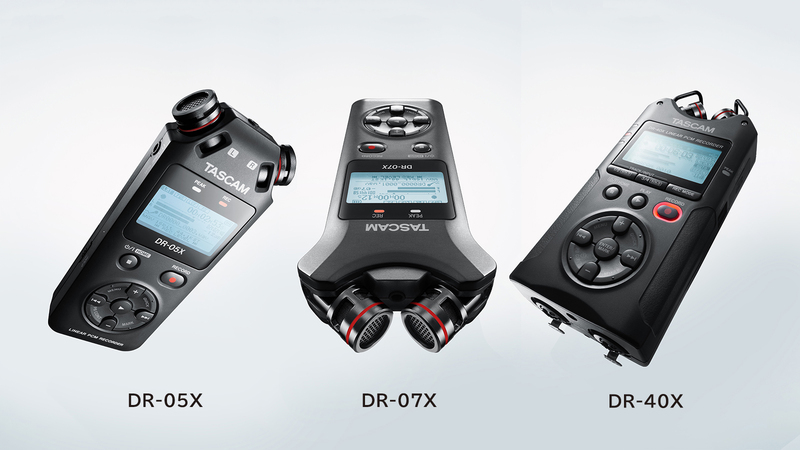 TASCAM has introduced the next generation of Its line of professional grade handheld recorders, the DR-X Series. A companion for videographers, voiceover artists, songwriters, and podcasters, the DR-40X’s integrated unidirectional stereo mics with scalable A/B or X/Y configuration, dual XLR/1/4-inch combo inputs, built-in phantom power for condenser mics, integrated four-track capability, and wired remote control option make it suitable for DSLR video, music recording, sound design, and more. For DSLR filmmakers, the DR-40X’s Auto-Tone function, provides an audio cue tone identifying each recording take. The new DR-X Series now adds a new model, the powerful yet affordable DR-07X, designed to deliver professional performance for musicians and voiceover artists. With its dual integrated scalable unidirectional A/B or X/Y configurable mics and crystal clear sound, the DR-07X is suitable for music recording, spoken word, and more. Incorporating all of the DR-07X’s features minus the scalable microphones, the DR-05X is equipped with a pair of omnidirectional condenser mics, making it a suitable tool for recording music, meetings, dictation, and more. The DR-X Series also taps into TASCAM’s decades of innovation in computer-based recording, incorporating a studio-quality 2 in/2 out USB audio interface that makes all DR-X Series recorders a fit for live streaming, podcasting, and digital audio workstations. All DR-X models boast a totally revamped user interface, making it easy to access recording, adjusting levels, deleting takes, adding markers, and other common functions with just the click of a thumb. Multi-language menus in English/ Spanish/ French/ Italian/ German/ Russian/ Chinese/ Korean/ Japanese/ Portuguese are included. And, with increased capacity for microSDXC cards up to 128GB, DR-X Series recorders can literally record for days on end.